On a Sunday morning in the last week of June 1940, the citizens of Coatbridge awoke to find large numbers of Polish Army soldiers billeted in the town. These troops were part of the Polish Army which had recently been evacuated from France. Whilst the Polish troops were stationed in Coatbridge only for a short time their presence in the town is fondly remembered. For the Polish troops who were stationed here they never forgot the hospitality they received from its citizens. The Regiment honoured the town by making it the "Mother Garrison" town of the Regiment. 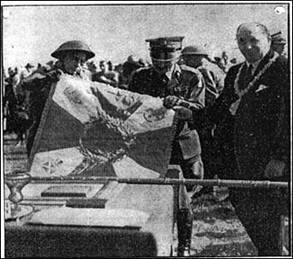 Later, in September 1942, the citizens of Coatbridge presented a standard to the 1st Light Artillery Regiment. (Fd Art Rgt) The Coat of Arms of the town was embroidered on the regiment's standard. The regiment in gratitude presented to Coatbridge a 'ryngraf' of Our Lady of Czestochowa, Queen of Poland. The ryngraf - "is a copy of this picture that a Polish mother would give to her son, a Polish wife would give her husband as he goes forth to battle, for it expresses Polish faith and belief. It keeps the memory of loved ones with loved ones, as we would wish our memory to remain with you." On 11th December 2009, BBC News Scotland ran an item about the Polish war plaque that was now on display in Coatbridge, at the Summerlee Heritage Museum.